Read the following ECG, it demonstrates which among the following? 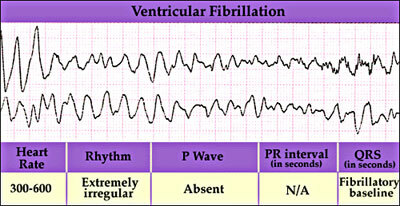 Ventricular fibrillation (VF) is characterized by rapid, chaotic, and asynchronous contraction of the left ventricle (LV). The surface electrogram of VF reveals a rapid, irregular, dysmorphic pattern with no clearly defined QRS complex. VF is associated with rapid hemodynamic collapse and is the most common arrhythmia resulting in out-of-hospital cardiac arrest. Furthermore, patients who suffer a cardiac arrest have significant risk of subsequent arrest. Note: The QRS complex is a name for the combination of three of the graphical deflections seen on a typical electrocardiogram (EKG or ECG). Q image; Image link: The above image is chosen and displayed from the web. This image do not belong to Gate To Medicine. The author is the responsible owner of the image. We believe that this image is helpful for your learning.